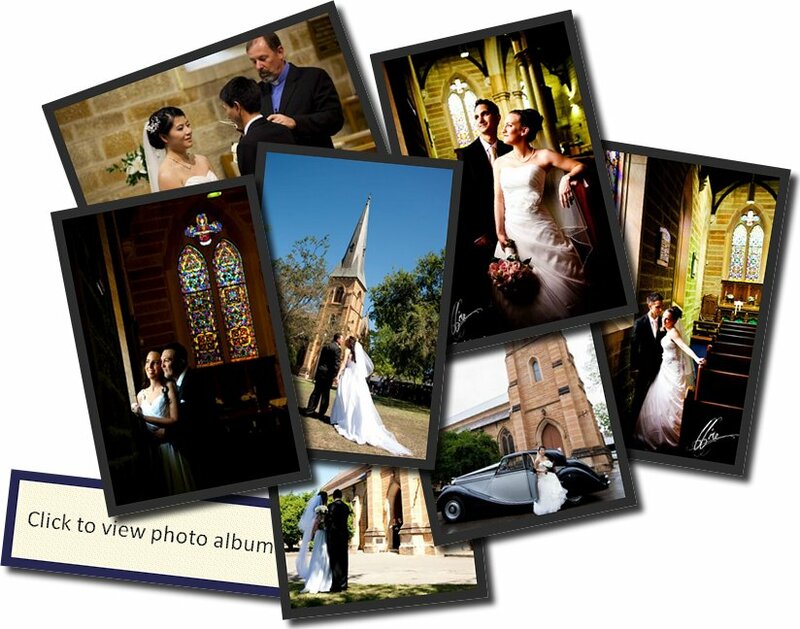 We would like to make your marriage service meaningful, memorable and enjoyable. The All Saints' Anglican weddings ministers are Rev. Owen Goddard and Canon Colin Aiken. We are also very happy to allow other Christian ministers to take wedding services in the church, if you would like to have a particular minister who is a registered marriage celebrant. Although weddings are normally held on a Saturday, other arrangements can be made, for example Fridays, other week days or Sunday afternoons. Saturday morning and Saturday afternoon services are very popular. Throughout the year the allocated times are 11am, 1pm, 3pm & 5pm. This means they are spaced at 2 hourly intervals. We are very happy to vary these times for special requirements at the time of your booking your service (for example 10am or 4pm). You can make a tentative booking, through the office, which will be held for a month. A deposit of $400 will secure your booking. We suggest you attend a Sunday Service: 8am (traditional), 10am (family) and 7pm (informal). 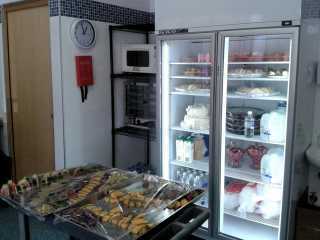 Monday, Wednesday & Thursday 9.30am to 3.00pm. and Pam, Betty or Penny will open the church for you. 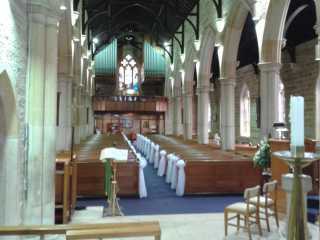 An All Saints Music Coordinator can help you coordinate the music for your Wedding Service. You can discuss what music you would like to have in your service. Perhaps a music group or soloist you would like to have, or the music you would like to enter and exit the church by, or organise the use of CD's, songs or hymns. The Music Coordinator can arrange for you as a couple to view a wedding from the organ loft to discuss your choice of music. Please contact the office on (02) 9630 1567 at least 3 months before your wedding or as soon as possible, to determine your Music Coordinator and get organised. The pipe organ is located in the western gallery of the church building. Built by the English firm of Hill Norman and Beard in 1966, there are 1,655 pipes, runs on 415 volts and draws up to 60 amps. The organ is used to lead a congregation in hymns and songs, and also to support a band - so becoming a "band instrument". It is capable of playing contemporary and traditional music beautifully. Organs have led Christian songs in churches for more than 1,000 years. Go to Sights and Sounds for video clips of our organ playing. Each week 7 vases of flowers are arranged (2 for each of the 3 communion tables & one main arrangement). These flowers are usually prepared on Fridays. Anyone wishing to discuss flower arrangements or supply extra flowers should contact the office to be put in touch with the Flower Coordinator. We do not provide service sheets but can email soft copies of the complete service and outlines so that you can construct your own service sheets. Some couples print most of the service, while others only give an outline of the services. Songs or hymns and Bible readings can also be printed in them. Please email a copy of your service booklet to the minister taking your wedding, for them to check, before you print them off. One or two Bible readings are to be read in your service. You may choose someone to read it for you, or the minister can. Soft copies can be emailed to you of the most common passages used, which many couples include in their wedding service sheets. If you are thinking of serving refreshments after your service you need to book them through the office when you are booking your wedding service. There is a cost involved and you will need to pay a bond. If you were to require an extended period of time for your refreshments, that might preclude a wedding being booked after your wedding, there is an additional cost. The rehearsal gives an opportunity to briefly run through the wedding service, and should only last for about 20 minutes. Couples being married by Rev. Owen Goddard can arrange rehearsals for Friday night a week before the marriage. Those being married by Canon Colin Aiken are often on Thursday nights. Please ring the office to arrange the rehearsal. At your rehearsal, bring the bridal party and whoever is giving the bride away - so you all know what to do on the day. Please bring a copy of your service sheet to the rehearsal. 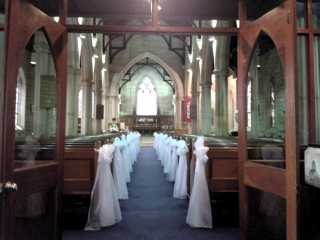 For weddings conducted by Non-All Saints’ Ministers opening the church for a wedding rehearsal is organised by ringing the office. We suggest a week night at 7.15pm., or any mutually suitable time. We ask that your minister meet with the representative from All Saints’ who opens the church. The minister will be asked to lock the church and turn off the lights at the end of your rehearsal. We encourage marriage groups to limit their rehearsal time to 30 minutes. If more time is required please inform the office. The church will be opened an hour before your wedding. 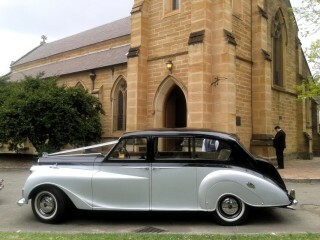 We ask brides to be on time or early for photos as they enter the church. Canon Colin Aiken & Rev. Owen Goddard look forward to meeting you at our orientation nights, which are held on 3 consecutive Mondays four times a year. Please be aware that this page may contain hyper links that contain content over which we have no control. We are not responsible for the policies or practices of these Web sites.